After an arduous political battle, initial funding for a NASA mission to Pluto and the Kuiper Belt of frozen objects at the outskirts of our solar system received formal approval when President Bush quietly signed an omnibus bill last week, Space.com has learned. PLUTO IS the only planet in our solar system yet to be visited by a spacecraft. Stern, of the Southwest Research Institute in Boulder, Colo., said he was a boy the last time NASA launched a mission that was so entirely new in destination, scope and scientific possibilities. “We’re going back to the roots of the space program,” he said. NASA had argued it was not time to go to the distant, tiny world, but members of the planetary science community felt it is important to go soon, while Pluto is favorably positioned and before it enters an even deeper freeze in its long, elongated orbit. The money allows Stern and his colleagues to proceed with final design of the spacecraft. Construction is slated to begin in the summer of 2004. 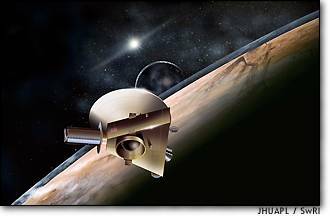 The probe is scheduled for launch in 2006 and would arrive at Pluto in about 2015, study the tiny planet and its moon, Charon, and then continue on in search of Kuiper Belt Objects. These frozen rocks, some roughly half the size of Pluto, have only been known since the early 1990s. Some scientists argue that Pluto should not be considered as a planet, but as a Kuiper Belt Object instead. A spokesperson at the Johns Hopkins University Applied Physics Laboratory, which will run the mission for NASA, confirmed the funding approval. An additional $130 million is set aside in the 2004 budget request, which is not yet approved. Those funds are aimed at the New Frontiers program, including funding for the New Horizons mission to Pluto and the Kuiper Belt, as the proposal’s language puts it. In total, New Horizons will need more than $300 million to get off the launch pad, Stern said. The total mission, including data analysis, must stay under a $504 million cap. Though NASA fought the concept, Congress wrote the money into the space agency’s 2003 budget. The bill signed by the president on Feb. 20 secures $110 million in NASA’s 2003 budget for the New Horizons project, Stern said. Of that total, $15 million is for a broader umbrella program called New Frontiers, but Stern said NASA had assured him all $110 million would go toward New Horizons. “It’s been a long road, 13 years, to get it funded,” Stern said. Also this week, prior to learning of the funding decision, New Horizons officials announced they would begin an immediate search using ground-based and space-based telescopes to hunt for possible other moons in the Pluto-Charon system. Other satellites might have gone unnoticed in the past. If they exist, they should tell a great deal about planet and comet formation in the outer solar system. The Hubble Space Telescope could look for satellites as small as 6.2 miles (10 kilometers) or even smaller if their surfaces are similar in composition — and thus light reflection — as Pluto and Charon. Stern said the Pluto-Charon system might have captured Kuiper Belt Objects, but its also possible the system has native satellites generated when the whole system was formed. The New Horizons spacecraft would be able to detect Pluto satellites down to 0.62 miles (1 kilometer) as it approaches the planet, but finding large satellites in advance would benefit the mission, Stern says. Average orbit: 3.7 billion miles, or 5.9 billion kilometers. Diameter: 1,430 miles, or 2,301 kilometers. Length of day: 6 Earth days, 9 hours. Length of year: 248 Earth years. One known satellite, named Charon.